Aboriginal Studies in white academic circles is in its infancy. Given its history, and the restraints arising from the colonial context, it would be surprising if the quality were much better. our ancestors did not have any need to colonize neighbouring lands and people. Lilla Watson, visual artist, activist and educator, was born in 1940 and grew up on the Dawson River in Queensland. 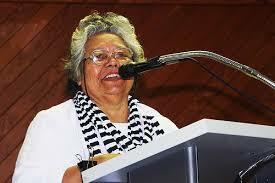 In 1979 she became the first Aboriginal person to be appointed as a tutor by The University of Queensland (UQ). Watson also worked for UQ as a lecturer in Aboriginal Welfare Studies and later served as an appointed member of the University Senate. She was also the Inaugural President of the Aboriginal and Islander Child Care Agency, a founding member of the Brisbane Indigenous Media Association and Vice President of the Aboriginal and Islander Independent School Board, Acacia Ridge. She has acted as a consultant and a member of working groups, Panels and selection committees for many Government and non-Government organisations.